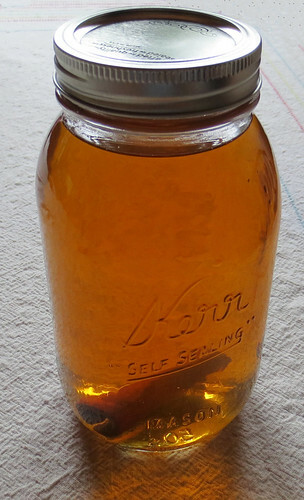 Here is my recipe for homemade apple pie moonshine. I researched the process and checked out a few different recipes and home brews to come up with this small batch recipe. In a large pot, combine juices, sugars, and cinnamon sticks. Bring to a boil as you stir occasionally. Once at a boil, remove from heat and allow to cool to room temperature. Once cooled, add vodka and stir well. Pour into sterilized Mason jars with one cinnamon stick in each jar. Store in a cool, dry and dark place for at least a month. After 3 weeks in dark cool storage, I had to test my moonshine. I served it over ice, and it was delicious. It has a good mixture of spicy, sweet apple flavor with a refreshing taste. Overall I’m thrilled with my very tasty homemade moonshine. Molsndry – Yes it contains alcohol. The whole batch has a fifth of vodka used in the recipe. But is the cider called for in the recipe alcoholic or not? Such as, say, an Angry Orchard or rather the kind in the juice aisle? Amber – It’s just regular apple cider on the juice aisle. The only alcohol is from the vodka. Hope this helps. Email me back if you have further questions. If you are British, All cider is alcoholic. typically anywhere between 3%-8% but can be stronger. otherwise its just apple juice. Thanks George for sharing your recipe. It looks like it would taste amazing. Jim – I still have some from this original batch and it’s fine. Tastes okay and stored good in my dark pantry. Hi there, I’m enjoying your site so very much. I just discovered you and can’t stop reading. On the juice and cider, did you use all natural no sugar added or can I use cheap store brand whatever? Also did you seal the jars in a canning method or simply screw on the lids and store? Thank you very much for all the info ! Can’t wait to try this. Hello PK – I just used some inexpensive apple cider that did contain sugar and was not organic. I just put the lid and ring on the jar and tightened it by hand. You do not need to process the jars in a canner for this drink. I still have a jar or two of this batch in my basement which has kept fairly well. I am so glad you enjoyed my blog here and if you are into crafting you can check out my other blog MyRecycledBags for more projects and ideas. Best wishes and thanks for visiting. @Dragos- I think it would be great in that dispenser! What if you added some everclear to this also? Russ – you could use Everclear but be careful with the amount. The alcohol content in my recipe is just 100 proof and most Everclear is 190 proof. Unless you really want to have your moonshine pack a punch, I would cut the amount of booze used in half if you use Everclear. A bucket will work too. I just like glass jars and the Mason jars are just cool to use also.